The Super AMOLED screen is now bigger at 5.5", but the dual-edge design and minimal bezel keep the illusion of a much more compact handset. In fact, just put it next to the iPhone 6s Plus, which also has a 5.5" screen diagonal and you'll see the amazing difference in footprint for yourself. The curve on the side is fairly minor, and the left and right edges of the screen remain mostly usable. The bezels are about 2mm thinner than we left them on the S6 edge, which is nice. The Quad HD (1,440 x 2,560) resolution may have looked like an overkill on the Galaxy S6 series, but it's a mandatory feature for the S7 lineup. Samsung's push toward VR certainly needs every pixel available so Quad HD is perhaps the meaningful, if not the minimum, screen resolution for a pleasant experience with the Oculus-powered Gear VR headset. Using the Galaxy S7 edge with a Gear VR is quite an impressive experience especially at first, and will get better with more and relevant content. Right now, there are plenty of photos, videos, and movies available for you to explore, and quite a few games. To be fair, however, individual pixels were visible in spite of the Quad HD resolution and the high 534ppi. Optical focusing issues seem to be another issue with some users at this stage to the point where they are not able to focus the image. It surely is promising, buy we can't wait to see GearVR Generation 2.0 whenever it comes out. The Galaxy S7 edge has the same maximum screen brightness as the S7 when you push manually the brightness slider all the way to the right. In overdrive mode, which kicks in under bright sunlight if you have Auto brightness ON, it goes quite a bit higher than the S7 to 610nits. The minimum display brightness is 1.8nits, which is perfectly suitable for late-night reading in a dark room and it's even a bit lower than the S7. Color accuracy of the screen is top notch as long as you opt for the Basic display mode. The other available modes make colors pop but they are nowhere near as color accurate as Basic (Average DeltaE 2000 of 0.8 and Max DeltaE of 1.5). For comparison, the Avg DeltaE in Adaptive mode is 7.2. The Galaxy S7 edge aced our sunlight legibility test, which means hasslе-free display performance even under bright sunlight. The score is pretty much the same as the Galaxy S7's, but a whisker lower than the S6 edge+'s. The curved sides of the display do reflect the light differently so sometimes there are brighter reflections there. It's not enough to be an issue, though. Update (03 Feb 2017): The Android 7.0 Nougat update for the Galaxy S7 edge is here and we promptly retested battery life since it’s a relatively major change. All tests were performed on the international Exynos 8890 version. We observed a significant drop in Wi-Fi browsing longevity, to the tune of 3 full hours. The new result on Nougat (again, on the Exynos version of the handset) is close to what the Snapdragon 820 version could achieve on Marshmallow. Still, what was a truly excellent web browsing endurance before, is now just a ‘good score’ after the update. It's not a spectacular showing in video playback either, where the drop in endurance is a whopping 5 hours. The thing is, the S7 edge's original 20+ hours of looping videos were so amazing, that even 5 hours less makes for a pretty great number. But we don’t quite understand what has caused the change. On a more positive note, the 3G voice call endurance has been improved by an extra 1:45h. All this makes for a slightly lower overall endurance rating of 92 hours (6h down from the Marshmallow firmware). We also tested if selecting a lower display resolution (a new feature introduced by Android 7 Nougat) would have a positive impact on the battery life. We compared the battery performance using the native 1440p setting as well as the lowest available setting of 720p. The short answer is - the change in resolution didn’t affect any aspect of the battery life - not in our testing routine. The minor differences we recorded were in the minutes, and are well within the margin of error of the tests. Perhaps an alternative usage pattern might lead to some meaningful advantages of going low-res, but our experience doesn't point in that direction. One such potential scenario is gaming, but then again you already had the option to limit resolution within Game launcher. End of update. The original text follows. Battery capacity is one more key area where Samsung gives you more than with the Galaxy S7. The smartphone packs a 3,600mAh power bank, a substantial increase over the S6 edge's 2,600mAh and the S7's 3,000 mAh capacity. Okay, the battery is still sealed, but that's a lot easier to live with when there's simply more of it. It's also quick to charge, even if the S7 edge only supports Qualcomm's QuickCharge 2.0 standard and not the latest version 3.0. Samsung promises 0 to 100% in 90min for the S7, but doesn't say just how rapidly those percentages climb from flat to, say, 70% where it starts to taper off. Much like the company's last-year flagships, the Galaxy S7 edge is also capable of wireless charging with pads compliant with both Qi and PMA. Samsung will also sell you a fast wireless charging pad, which can fill up the battery nearly as fast as a cable will. Now, let's move on to our test results, where the S7 edge does indeed outlast its predecessor and its smaller sibling. A day of voice calls on a 3G network is five hours more than the S6 edge, and the 20 hours of video playback are about 8 on top of last year's model, and an impressive achievement in its own right. Such usage pattern is of course entirely artificial, but we've established it so our battery results are comparable across devices. 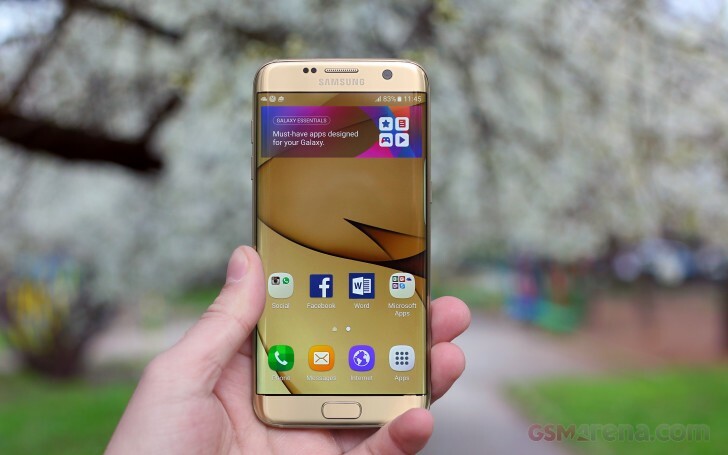 Its web browsing also went up with 2 and a half hours up to 13 and a half hours with the built-in TouchWiz browser. The Always On display feature was always going to be a battery drainer, no two ways about it. Samsung's claim that it would cost you 1% per hour seems about right and it does leave a huge impact on the overall endurance rating. That's because our proprietary score also includes a standby battery draw test, which we carried out with the AOD off and then once again with AOD on. These results are not featured in our test scorecard but are calculated in the total rating. Since its launch, the AOD setting has been optimized and now allows you to schedule times to activate it. Of course, your mileage will vary depending on how long you keep the phone out of your pocket. The Galaxy S7 edge did splendidly with an Endurance rating of 98 hours - that's the amount of time the S7 edge would last on a single charge if you use it for an hour of 3G calls, an hour of web browsing, and an hour of video playback each day. Turning on the AOD drops the rating down to 67 hours - a huge impact, but still a good score - that's few hours short of three days. Finally, if you want to use the Edge feeds, which require the screen to sustain the capacitive sensors always on, you will lose additional 7 hours, bringing the total endurance down to 60 hours. Update: We've managed to acquire the Snapdragon 820 flavor of the Samsung Galaxy S7 edge and we re-ran our battery routine. The call test was alright, but the video and web battery tests dropped down by 20%. The standby endurance turned out a tad lesser than the Exynos model, and thus the final battery rating dropped down to 87 hours. If you want to use the Always-On Display, then the rating is reduced further down to 63 hours. While we are not happy by the 10% drop in the final score, 87 hours is still quite a respectable number for a flagship like the S7 edge. Samsung's Exynos 8890 chipset is paired with an LTE Cat. 9 modem. Theoretical maximums are 450Mbps of downlink and 50Mbps of uplink. If you have access to an HSPA network only, you'll get a maximum of 42Mbps and 5.76Mbps respectively. The Samsung Galaxy S7 edge supports Wi-Fi ac networks for fast local connectivity. Wi-Fi, a/b/g/n at 2.4GHz and 5GHz networks are also supported, of course. Then there's Bluetooth 4.2 LE (for smartwatches, sport sensors and such) and apt-X codec (for high-quality audio streaming). NFC support is enabled, used for Samsung Pay, as well as for pairing with other devices and reading NFC tags as well. The microUSB 2.0 port on the bottom of the phone supports fast charging and regular USB 2.0 transfer speeds. With the included adapter you can easily use the USB Host and OTG support, connect a mouse or a keyboard, USB flash sticks, or just use the Galaxy S7 edge as a power bank. We noticed the Galaxy S7 edge lacks MHL support, which should render wired TV-out impossible. But the wireless options are there.